← Miraa Chewing among the Youth. Six died in the scuffle between the rival groups and anti-riot police a few hours after the Supreme Court confirmed Uhuru Kenya as president elect. After the ruling, Uhuru supporters were seen jubilating in parts of Nairobi streets. Other parts of Nairobi streets experienced scuffles between outraged Raila supporters and anti-riot police officers. The scuffles spread quickly to slum areas in Nairobi and Kisumu, resulting to loss of lives. In Nairobi, a youth in Mathare slum sent me a twit message requesting me to contact the police to increase the number of security officers because tension was increasing in the area. 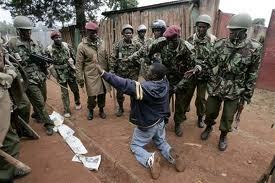 Images of running battles between irate youths and anti-riot police were witnessed in Olympic area in Kibera too. In Kawangware slum, Raila Odinga supporters attacked their rivals with machetes. The incident left 30 people seriously injured. Later at night, Uhuru supporters retaliated and left more 30 people seriously injured. In Dandora and Githurai slums, six people died in the skirmishes as a result of political rivalry. Two others were shot dead by anti-riot police in Kisumu. Although Raila Odinga and Uhuru have called on their supporters to come together and start working, the tribal stream has simply widened. Uhuru’s supporters view Kalonzo Musyoka supporters as traitors. The attitude has extended to local trade. Uhuru supporters cannot buy or sell stuff to Kalonzo supporters. This is already happening in Mulolongo, Kibera, Kawangware and other parts of Nairobi suburbs. Addressing the media through a televised speech, Uhuru said his administration will work with all Kenyans. “I want to assure all Kenyans, including those who did not vote for the Jubilee Coalition, and indeed even those who challenged the validity of my election, my Government will work with, and serve all Kenyans without any discrimination whatsoever,” President-elect Kenyatta said. Prime Minister Raila Odinga conceded defeat a few minutes after the court’s ruling on 30th March 2013, but insisted the March 4 presidential elections were stained with irregularities. 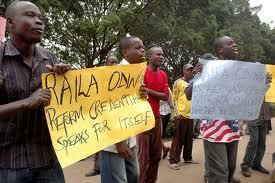 Odinga said although he would abide by the Supreme Court’s verdict, CORD had evidence of malpractices in the elections. He added, the technological failure witnessed during the polls required a full audit. The Prime Minister maintained that the Independent Electoral and Boundaries Commission staff engaged in electoral fraud. He alleged it was irregular for the IEBC to share its server with his political competitor. Chief Justice Willy Mutunga said the court’s decision was unanimous on all the issues they were asked to rule on. “The presidential election held on March 4th 2013, was conducted in a free, fair, transparent and credible manner, in compliance with the provisions of the Constitution and all relevant provisions of the law.” Mutunga Said. He also dismissed the two petitions against Uhuru and Ruto and declared the duo validly elected as president and deputy president elect respectively. Raila Odinga’s prayer seeking recomputation of votes cast between him and Uhuru Kenyatta was also declined on grounds, the court did not have jurisdiction do so. Douglas Namale is the founder of Community Media in Kibera, Managing editor of Mtaani Insight (www.mtaani.net) and a Mapper at Map Kibera Trust. He is a former managing editor of Kibera Journal (www.kiberajournal.org) and an ICT literacy activist particularly among the youth in the slums and rural areas. He is also a facilitator in Community Media, good governance, active citizenship, Open space technology, Access to information and Freedom of expression. He has presented his work in different global platforms including, ICT4D 2010 in London, Broadcast and Film Africa Conference in Nairobi in 2011 among others. He believes an informed citizen is an empowered society. I strongly believe the ICT tools and citizen journalism will form part of 3rd liberalization in Kenya. This entry was posted in Elections, politics and tagged Raila Odinga, Supreme Court, Uhuru Kenyatta, Wiliam Ruto. Bookmark the permalink.